How to make the most of the software? If you have just started working with the software, or if you have spent time managing it, you may not know some of the incredible features that it includes. With this mini-tutorial we hope you can make the most of the software and help you even more with the management of your business. Before making a mating between two animals, it is possible to calculate what will be the percentage of consanguinity. A very interesting option to know quickly "the quality" of that mating. Inbreeding is automatically calculated of that mating. You can plan a litter for the future (the puppies have not yet been born) and make reservations for that planned litter with or without money deposits (for example $100 to reserve a female. Puedes planificar una camada para el futuro (los cachorros aún no han nacido) y anotar reservas para esa camada planificada con o sin depósitos de dinero (por ejemplo 100 € para reservar una hembra. As you can see, the options are endless. 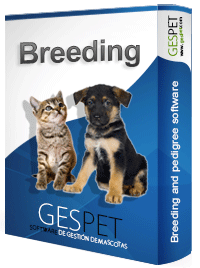 Management as you manage your hatchery, Gespet adapts to your needs. It is so easy and you do not need to exit the software. If you click on the email address of a client, the email manager will open automatically with the address already selected to send an email to that customer. If you press on your phone a call is initiated or on your WhatsApp, the app opens. note: Call and Wahtsapp options require the device to make calls or send WhatsApp. Here you can check more info about this. By clicking on the button "Locate on the map", the location appears in Google Maps. In this way, it is possible to calculate the route, distance, and see the address in detail. If every time you do a new service you offer your clients legal or informative documents, service's conditions, data protection, exclusion of responsibility, ... you will know that it is not an easy task. So that you do not forget any document, you do not have to search it on your computer, etc. .. you can configure the documents in the software and every time you make an entry, reservation or exit the corresponding documents will be displayed. When you make a new Nursery booking, the "document of prior information and veterinary requirements"
When you make a Hotel check-in, the documents of "Conditions of stay" and "Legal conditions"
This is just an example, you can configure as many as you need. For example, this list of clients is sorted Alphabetically by name, but you can change it and it is ordered by the address, location, ... simply by clicking on the corresponding field in the header of the table. You can also export the information in .xls format, so you can open it using Excel and in this way create your own custom reports, combine fields, correspondences and much more. Therefore, the software takes care of it and offers you all the information about your business, updated in real time and even the forecast and estimate based on the data from previous years. On this desk there is a calendar. By default, the current day is displayed but you can navigate between days and the information displayed will change. Now the information for that day will be displayed. In the central part, the agenda of the day appears, with tasks, events, notices and all the important information for the selected day. The events that you have recorded for today, the tasks and their priority, and any notice for clients, animals, suppliers, ... all the notices together in the same screen. If you have to call Claudia next week, include a notice, and the software will remind you on the day indicated.